Ever since Tom Holland’s Wall-Crawler swung into action in 2016’s Captain America: Civil War, Marvel fans have been pining for his first full feature as Spider-Man. Now, we know what you’re thinking: another Spidey movie? But it’s only been three years since the release of Amazing Spider-Man 2! And though that may be true, thanks to a licensing agreement between Marvel and Sony – a licensing agreement that many had considered to be wishful thinking hitherto – we’re now teetering on the verge of Spider-Man: Homecoming, Jon Watts’ imminent reboot that takes one of the most iconic superheroes in the business and slaps on an exciting new lick of paint. Quite literally, as it were. The end result is a summer blockbuster that’s already been championed as slam-dunk for Marvel – analysts predict a strong box office opening in the region of $150 million, which is just north of the same domestic opening achieved by Guardians of the Galaxy Vol. 2 earlier this month – and the studio has assembled a who’s who of Hollywood talent to help bring the story of Homecoming to life. Not only do we have Holland in the title role, but there’s also Michael Keaton (The Vulture), Zendaya, Donald Glover, Marisa Tomei, Robert Downey Jr. and Bokeem Woodbine, the latter of whom is attached to the part of The Shocker (AKA Herman Schultz). Together with Keaton’s souped-up Vulture and Michael Chernus’ The Tinkerer, The Shocker is set to become one of the film’s primary adversaries, which can only present more trouble and headaches for our friendly neighborhood Spider-Man, who is so passionate about protecting the city he loves that he’s willing to cut class to do so. 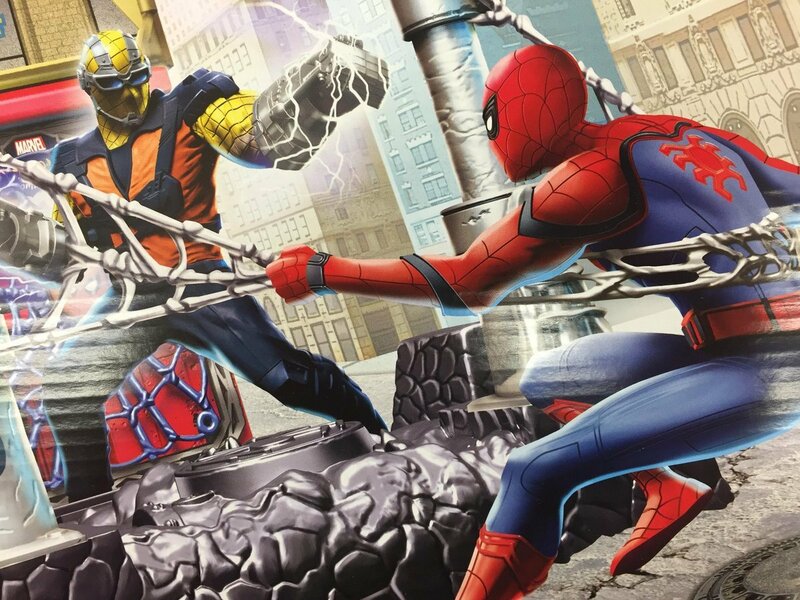 With little over a month to go until release, CBM has now unearthed a piece of concept art that visualizes The Shocker in action, while there’s also a peek at the film’s official standee courtesy of Tom Holland’s Instagram feed. Spider-Man: Homecoming zips into theaters on July 7th.